Finished up the list and headed out this morning to another round of grocery shopping. This upcoming week holds quite a few new recipes! It looks like the dogs will be happy as they get to test a new treat recipe for them. One of the recipes has an interesting combo that we havent had before. 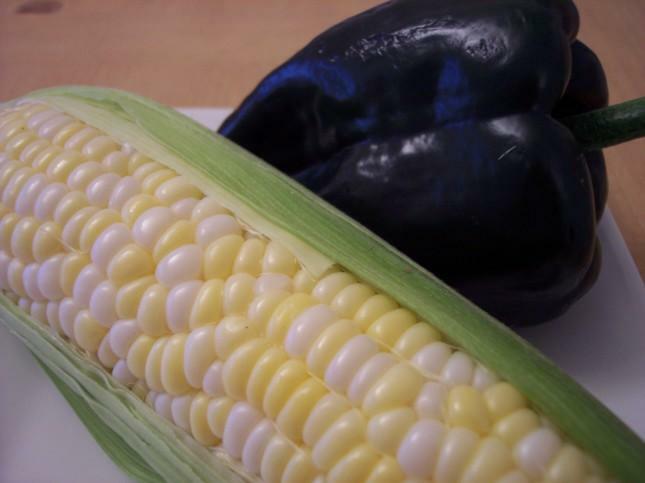 Fresh olathe sweet corn and poblano peppers. Any guesses as to what we will try to create with that?! Last nights DVD was a bit odd. I really had no idea but was not expecting what we saw. Some points we were tempted to turn it off and go watch Big Brother but stuck it out. Overall it wasn't a bad movie but just not what I thought it was about. Tonight's selection from netflix will be Finding Neverland. Watch for updates each day this week to see what results we get from the kitchen! The ingredient amounts are correct so be careful when measuring. This makes 6 large cookies. 2. Place flour, cocoa powder, baking soda, and salt in a small bowl - whisk together. 3. Place 1/4 cup + 2 tsp sugar, butter, and the egg in a medium bowl and beat with a hand mixer on low speed until blended. Increase speed to medium and beat until light and fluffy. Add flour mixture to the egg mixture and beat just until the dough is blended, 15 to 20 seconds. 4. Roll rounded teaspoonfuls of the dough in your hands to form 12 equal balls, and place on the prepared baking sheet. Space them 2" apart. Pour about 1/2 cup sugar into a small bowl. 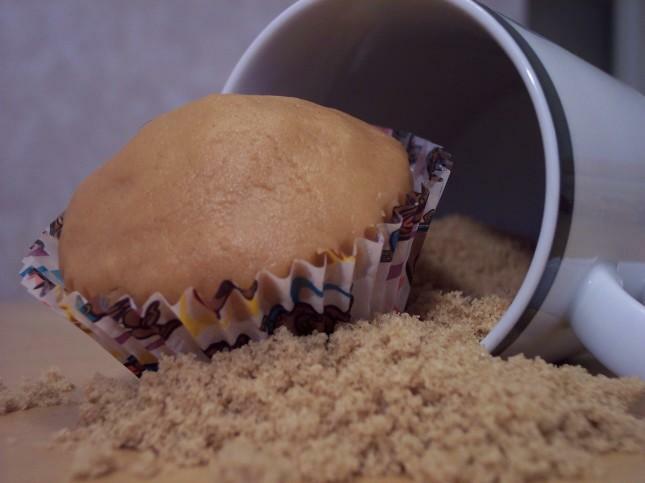 Dip the bottom of a drinking glass into the sugar, and press the glass onto a ball of dough to flatten. Repeat with the remaining dough, dipping the glass into the sugar each time. 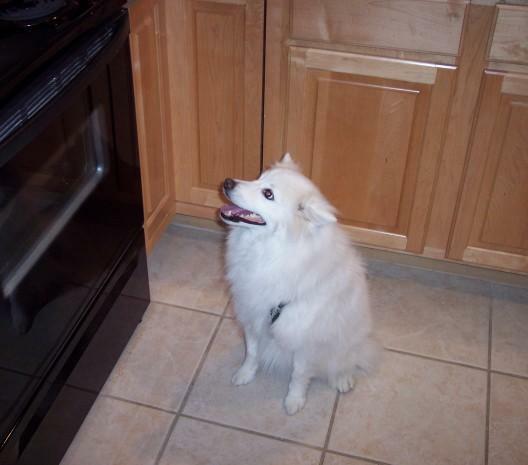 Bake till firm - 14 to 15 mins. 5. Remove the sheet from the oven and cool completely on a wire rack. 6. Spread 1 1/2 tsps of the filling over the flat side of half the cookies. Place the remaining cookies on top, flat side down, gently pressing down on them to squeeze the filling out. Place butter, shortening, milk, vanilla and salt in a small bowl and mix with a fork until smooth. Add the confectioners sugar and mix until well blended and smooth. This may take a couple minutes. Cover the bowl and set aside at room temperature until ready to use. For the mocha version use 1/4 tsp instant espresso during step 3 of the cookie. For the filling dissolved a pinch of the espresso into the milk. The weekend is here! Wish I could jump in the pool... that would feel soo good today! Its getting more and more humid outside now. Spent most of the morning running around to pick up a new ceiling fan for the living room. Went to Moon Valley Nursery to grab some supplies for the new lemon and palm trees too. Last week I mentioned that we couldn't find a local source for instant polenta. I was so surprised when I got the mail yesterday and found this inside! You guys rock! Thanks Mari K and Debra so much! I will have to go back through the recipes and see what other ones I had that used this! Starting to get the menu ready for this week - looks great so far with at least a couple new recipes. Going to go sit in the nice AC and watch what Netflix brought to us this week. Tonight's DVD will be Dogma. No idea what this movie is about so should be interesting! Chicken salads for dinner as always. Stay tuned for all the updates this week! I went to see the doctor today for the first follow-up visit after the surgery. He took my stitches out and gave me a different medication to start on. I have two exercises I need to start working on until I see him in 2 weeks. One of them I am suppose to pull my arm over my head.... I kind of laughed when he said that and went yeah right! I will do as he suggested but I don't have to like it! 99 Ranch Market is an ethnic grocer that is right across the street from the orthopedist. I've never been there and since I had some time to kill I went over. The store had so much stuff that I had no idea what it was. I did see some stuff that I've read before in recipes but didnt have a source for them. Some of the more interesting items like chicken feet, pig stomach's, and pig snouts I could have lived without seeing but if you ever happen to need that let me know! Delving into the unknown for dinner tonight as I made Tabbouleh with Shredded Roast Lamb. I served this salad type dish over a halved pita that was toasted. Bulgur was the main grain and was simply made by adding boiling water then covering for 30 mins. A+ for simplicity! 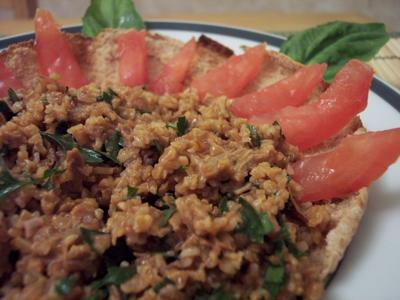 The added herb, lemon juice and olive oil meld with the natural flavor of the bulgur. 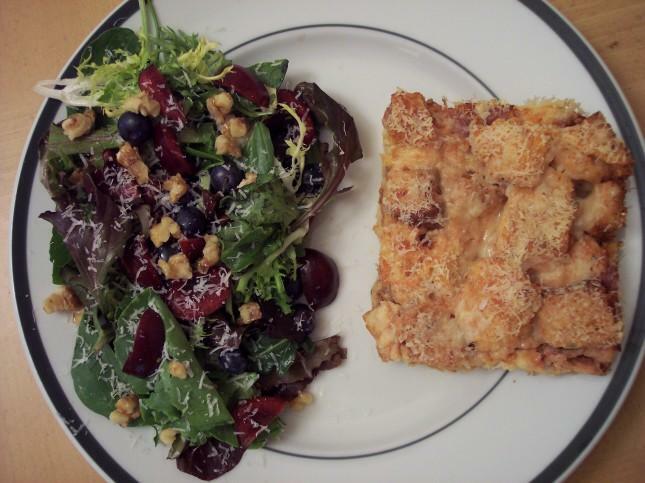 I will be on the look out for more recipes like this! Small batch baking strikes another winner! 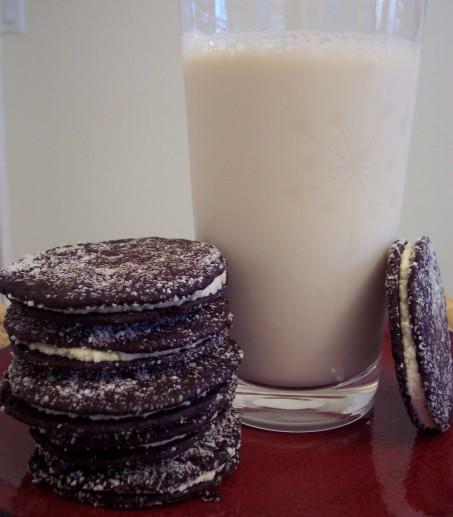 These are mocha cream filled chocolate cookies (think giant oreo's). The recipe only makes six (thankfully..!) but they are still quite large. The crisp deep chocolate cookie really pairs well with the thick mocha cream. I did add some instant espresso to the cookie as I usually do anything with chocolate. I think it really enhances the chocolate flavor. I prepared two new recipes tonight for dinner. First is Sour cream, Cheddar, and Green Onion Drop Biscuits. 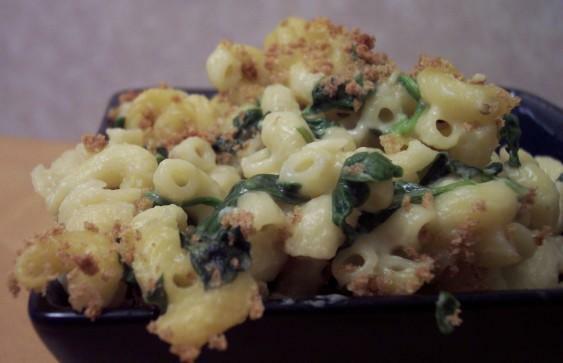 Second was Smoked Gouda Mac and Cheese with spinach. 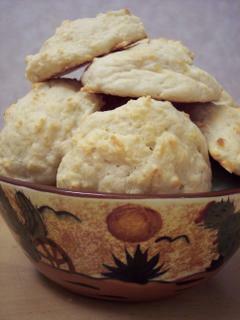 The biscuit texture was so tender, fluffy and they were such a snap to throw together. I used white cheddar for the cheese and think this was an excellent choice. If you wanted a more cohesive shaped biscuit you could even do these in muffin tins. The mac and cheese was described as "yummy!" when I asked so that has to be good. 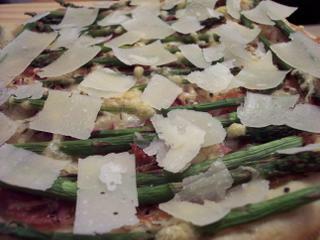 The inside was so creamy with a nice crispy crust from the Panko breadcrumbs I used. A pretty healthy dish to off-set the damage done earlier! Today I needed to pick up a nice piece of beef tenderloin as it was needed in tonight's dish. Whole foods was on my agenda and I knew we really enjoyed their meat selection. After wandering the aisles for awhile (could spend hours there!) I finally found what I needed and finished up the rest of my errands. 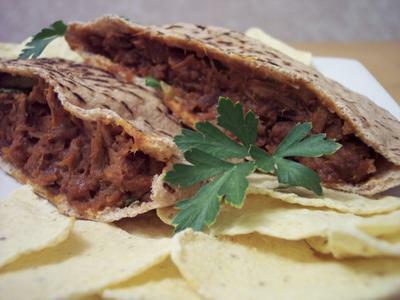 Chipotle shredded beef tenderloin stuffed into whole wheat pitas was on tap for tonight. We really enjoy spicy foods and this fit the bill. I used some chipotle in adobo sauce for the main heat and toasted, then ground cumin seeds to bring the flavors together. Simple tortilla chips finished out our meal for this evening. From what I hear the butterscotch nugget bars went over quite well in the office today. Definetly a repeater! Since it's tuesday today I needed to find something that Jeff could take into work tomorrow. I was not sure how much I would be able to do but found something that was fairly easy on my shoulder. After going through my recipe piles and thinking I definetly wanted something new I went for Butterscotch nugget bars (BBCL). This bar cookie has a dense buttery base filled with a mixture of softened cream cheese and butterscotch. Topping this was a mixture of toasted sliced almonds and a reserved amount of the cookie's base. 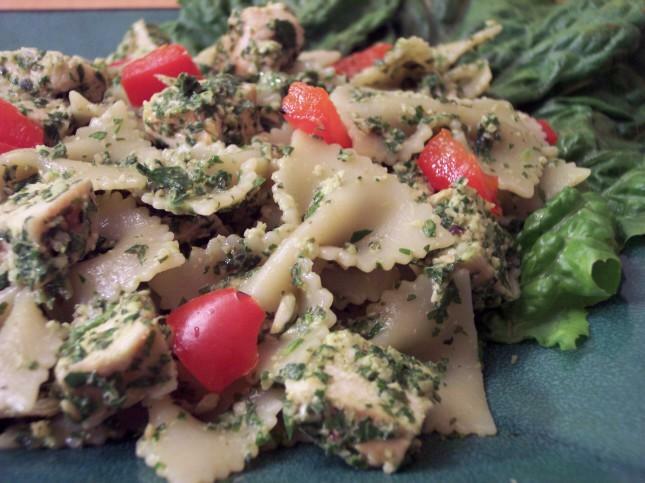 With the fresh basil from the farmers market tonight's dinner was Chicken and Bowtie Pasta salad with a Walnut Pesto. The toasted walnuts in the pesto really bring out a great flavor. 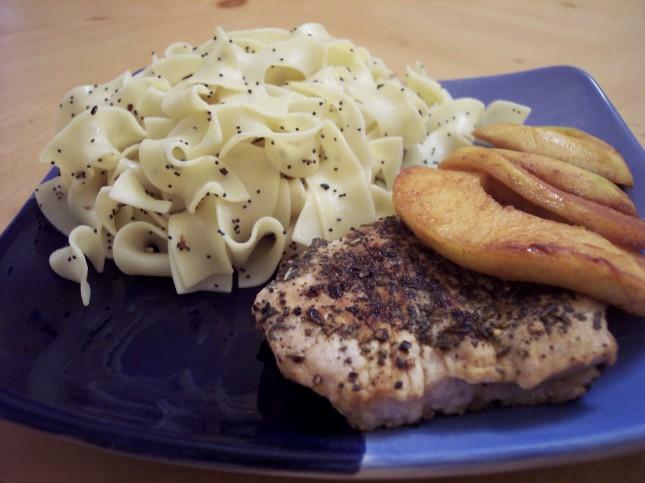 Tender grilled chicken along with al dente pasta made this dish a big hit! I saw this in the news yesterday. Hershey's is buying Scharffen Berger. I'm not too happy about this especially if they decide to fuss with how they are currently doing SB's chocolate. We use them frequently and really enjoy the taste - even if it tends to be more expensive. Its worth it. If this move just exposes Scharffen Berger to a wider market and makes it more available then I'm all for it. Just don't mess with it! What do you think? 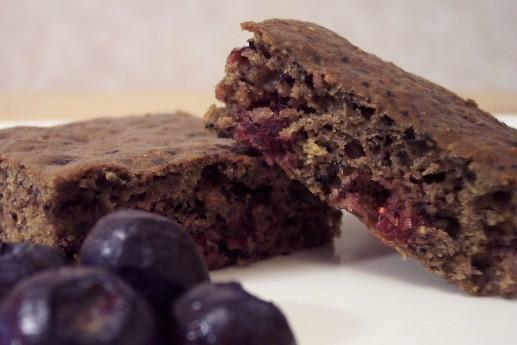 Instead of always buying energy bars or breakfast bars I thought we could try a couple different recipes and see if we can make something good to replace them. The first I tried today was called Multigran fruit bars. Its packed with fresh blueberries, dried cranberries, brown sugar and Kashi puffed cereal. I was also able to use the food processor so that was another plus. Baked in a 9x13 the batter going in was pretty thin but they still rose up nice! They are more "cake-like" which is a refreshing change as they are pretty light. Very tasty and perfect for hiking or just snacking! I was in the mood for comfort food tonight so dinner was Individual mini meat-loaves, mashed potatoes and grilled fresh sweet corn on the cob. It went pretty well together and really had that down home feeling. 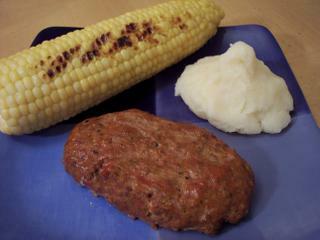 The meat-loaves were very juicy and the corn was delish! Its been too long since we've had fresh corn. New pesto recipe for dinner tomorrow... until then! After going thru the list of recipes I set aside for this week we needed to go to the farmers market to pick up a few things. Thankfully its not too far off our grocery store path so we can get there pretty easily. 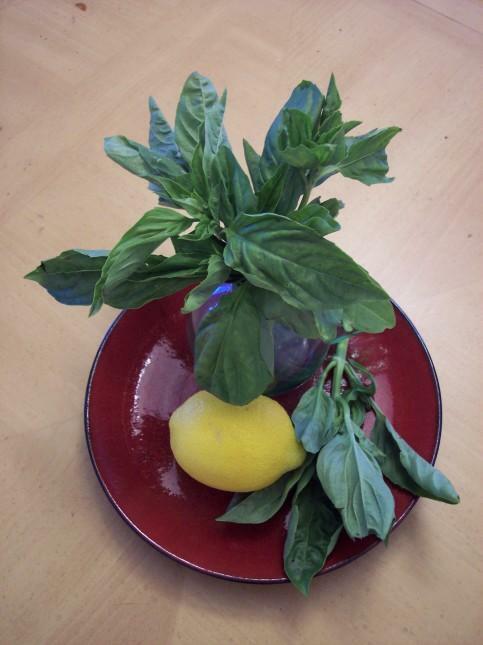 One thing I really needed to get was some fresh basil for a pesto dish. The market didnt have too much to choose from today but I think we did good for the basil! I was outside early this morning and noticed a tree rose bush we planted a few months ago is finally coming into its own. 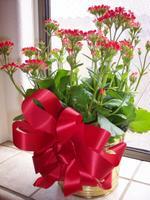 This was the first time we have ordered a plant from QVC and I'm very happy with the turn out! 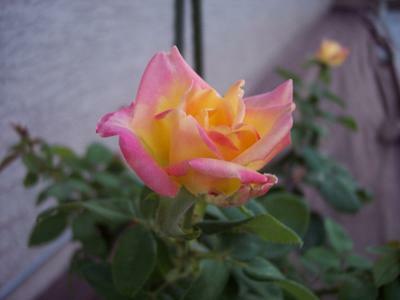 Hopefully it will continue to bloom and be able to stand this awful heat here! Quick dinner tonight of turkey hot dogs (so inspiring huh?) with spicy tortilla chips. Far from gourmet but fast and easy! I think we are going to watch another DVD tonight. Elf was apparently next on our list. X-Men 2 was much better than we expected - if you liked the first one the second is just as good! Stick around this week to see what happens with these new recipes - who knows how it will end up as we are even going to try to tackle Tabbouleh later in the week! I received a couple beautiful get-well plants yesterday. Thanks - they are enjoying all the sun from the kitchen window. Had to run to home depot as a couple of the recessed lights above the island went out again. It seems like we replace them and then another goes out! After that it was off to the pool store to get some chemicals to keep that from getting cloudy. 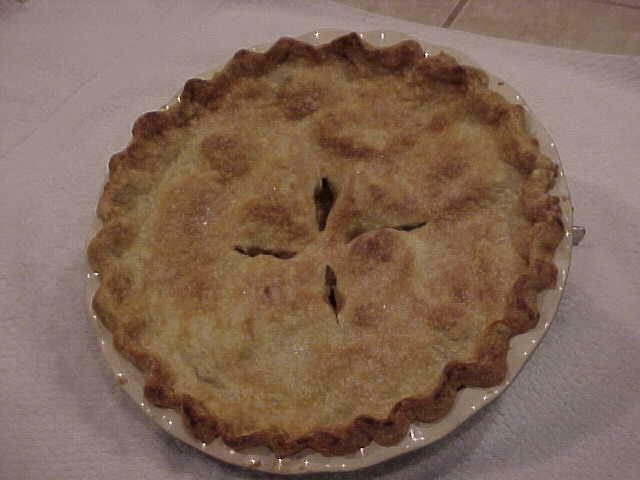 I used the new food processor today for a pie crust. It came out pretty good - I was skeptical since i've always done it by hand but this was much faster. Here is the apple pie I made this morning - we each had a small piece after lunch. There is nothing like coming home and having the smell of cinnamon and apples throughout the whole house. Yum! Chicken salads tonight for a quick dinner. Netflix brings us X-Men 2. The first one was pretty good so I hope this one lives up! Before the movie starts i'll be going through the recipes to decide what goes on the menu for this week. Finally received a new toy that I have been wanting for quite some time! This kitchen aid 12 cup has 3 bowls - 12" 10" and 4". It also has an extra wide feed tube so most things will not need to be cut in half. 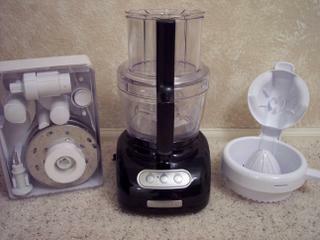 Now I can pull all the food processor recipes that I had set aside in the event I actually got one! Woo!! 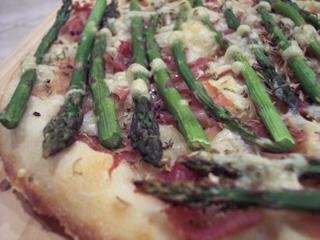 Tonight for dinner was a repeat recipe that we really enjoyed before. It has been some time since I made it. Cheesy rice casserole with sour cream and jalapeno's is presented below. It has a nice mix of flavors and is not overly hot. I served steamed veggies to go along with this dish. 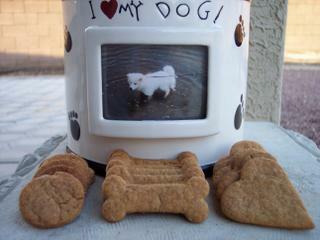 I've gotten a few requests for the doggie biscuits so here is the recipe for that. 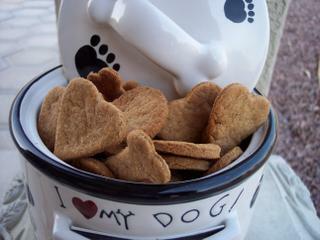 Roll the dough out to about 1/4 inch thick and use small to medium cookie cutters to cut out shapes. Place 1/2 inch apart on ungreased baking sheets. Bake 12-18 minutes or until lightly browned. Cool on wire racks and store in the fridge or freezer. Surgery went as planned this morning although it took almost 2 hours in recovery. The Dr. said it should only have been 45 mins! I will be back tomorrow with a new dish and pictures - I just type slow now but I am determined to be back in the kitchen! When we got home today I had a package waiting for me that will definetly be a big help in the kitchen. I will also get pictures of that for tomorrow. Its 4:50am and i've been up for awhile this morning. Getting ready to leave shortly but just wanted to give a quick update. Having surgery on my shoulder today to try and repair a torn tendon in the joint area - it should be interesting. Should be back tonight if everything goes well. I'll still be cooking and baking - even if I have to with one hand! This morning I saw the last of the doggy treats were given out so I figured I better make some more before they start a revolt! I knew I was in trouble when I put the first batch in and a couple mins later I found this. Needless to say they were quite happy to get them! They didn't like that they had to wait for them to cool. We put them in their favorite doggie cookie jar. 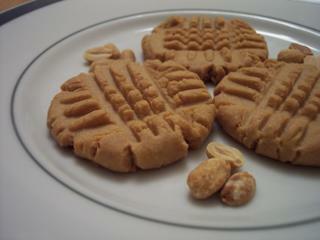 They are Peanut butter snap biscuits. 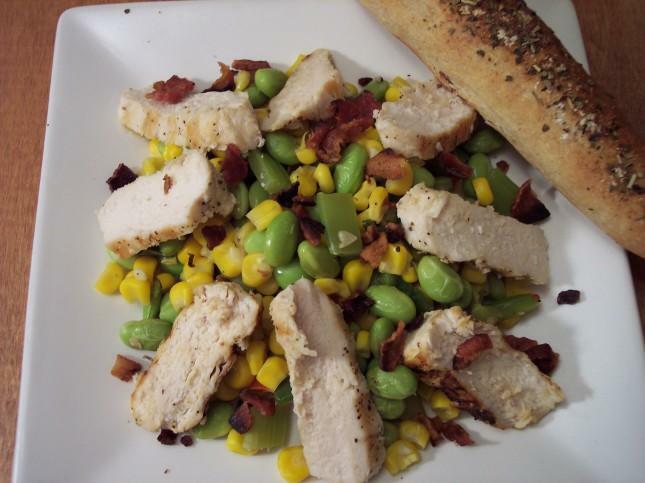 Edamame succotash with chicken and garlic herb breadsticks was on tap for dinner this evening. I had this in my to-try pile for awhile but finally got around to making it. This was a very good combination and one large jalapeno made it quite spicy, but just right. I think next time I make this I will use shrimp instead to give it a different flavor. The heat was just unreal this afternoon. The sun turned this dull red/orange color with all the dust in the air. They say the monsoon season is suppose to offically start tomorrow. I really hope it cools down soon! 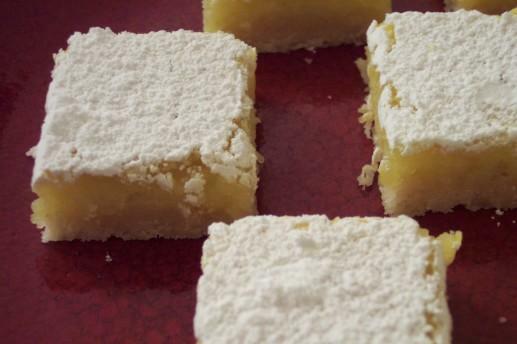 Time flew by today... but I did fit in some time to make "classic" lemon bars for Jeff to bring into work tomorrow. I wasn't sure what to make but I saw that I had enough leftover lemons from last nights dessert and I knew we already really liked this recipe so I needed to make them. I added a bit more lemon zest and juice as I normally do. We wanted them in small pieces so it was just a bite of lemon goodness! Tonight's entrée was Center cut Pork Loin Chops with Cinnamon Apples. I served buttered poppyseed egg noodles on the side. This turned out to be a great combination as pork and apples usually are. The pork was seasoned simply with a mixture of rubbed sage, salt and pepper. I loved the poppyseeds on the noodles - it gave it some great texture. 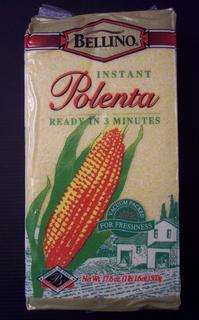 Okay, so I confess - we have had polenta before but it has always been in the premade "tubes". So when I found a recipe that actually has you make it I figured it's about time we do it ourself. Of course it calls for instant polenta and I couldnt find it anywhere here. We settled on what was labeled "yellow corn grits AKA polenta" from Bob's red mill. It was very interesting as it turned thick quicker than I expected. I started to second guess myself if I put in enough liquid but, determined that I did I let it go and it turned out well! Bye bye tubes! 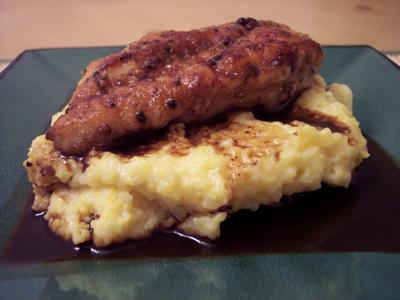 Tonights dinner was Sautéed Chicken Breasts with Balsamic Vinegar Pan Sauce served over Two-Cheese polenta. The chicken was very moist and the outside was nice and crisp. We used the combo of butter/oil and the flavor really came through. For dessert tonight I really wanted something that was refreshing and had a clean taste while still being light. 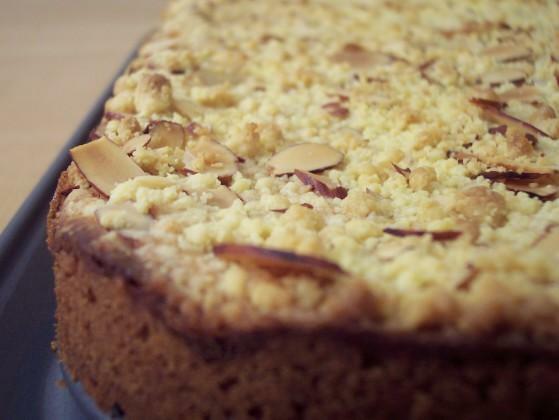 I made Butter Crunch Lemon-Cheese Bars(CL). 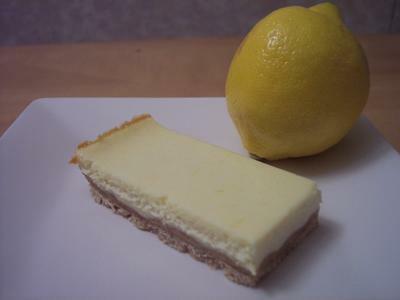 It is kind of like a lemon bar/cheesecake type filling over a crunchy brown sugar crust. Well so much for no oven use today! Hee hee! 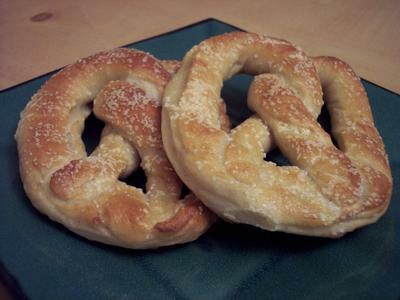 Someone has been talking about wanting homemade pretzels a lot recently so while eating lunch I decided I had enough time today to make up a batch. Pretty good! The outside is a little more rough after boiling than I am used to but it the taste is right on and the texture was good after baking. 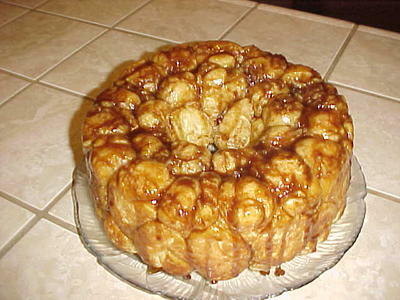 Since i'm up so darn early in the morning I thought I would make a treat for breakfest. Below is the monkey bread I've been making for awhile and thought it would be perfect today - besides there is no way I'm heating up the oven later today after being out grocery shopping! After that was done I was able to finish up the grocery list and get going. Got most of everything but after all the stores we went to today I couldnt find Instant Polenta. Maybe it was called something else but I didnt see it. We decided to go with the regular where you need to cook it for 30 mins. Oh well - I just need to adjust for the time tomorrow. Lots of new recipes will hopefully be made this week so make sure you come back and see what happens! And in with the new! Baking pans that is. Calphalon pans caught my attention at 50% off so I had to grab what I could. 2 9" cake pans and a pair of springform pans - 9" and 10". We spent some of the morning repainting some odds and ends to match the master bedroom. We will finish it someday. Maybe soon! We watched the movie Son of the Mask tonight. It was okay - funny enough though! I will be spending the rest of the evening preparing next weeks menu and getting the grocery list for tomorrow started. Dinner tonight was just our saturday chicken salads. Dessert was a vanilla custard/pudding. 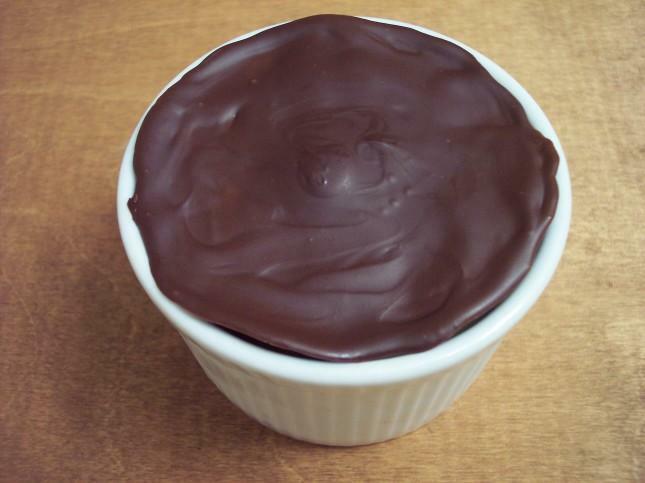 I couldn't decide what I wanted to top it off with so I make a bittersweet chocolate "lid". 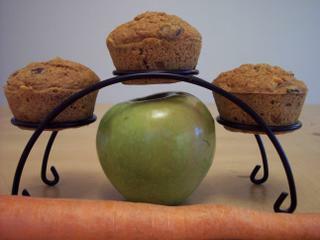 I made one of our favorite healthy muffins today. We have been making these for some time now and really enjoy how moist and flavorful they are. They freeze well and they are a great quick healthy snack. 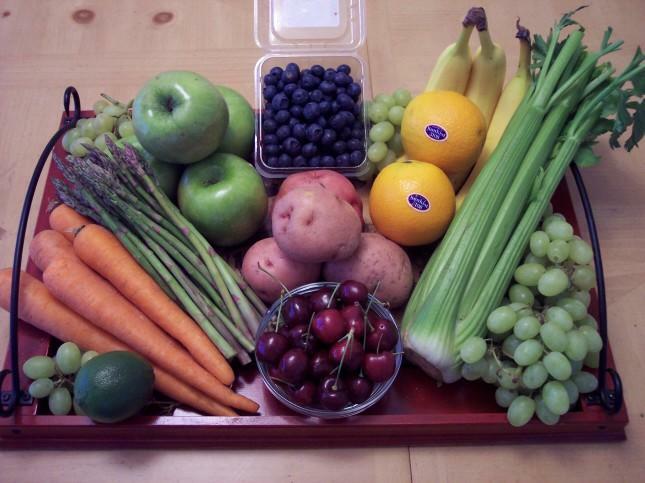 It is full of apples, carrots, craisins, and cinnamon. I have tested them with Splenda before and they still had the same integrity of previous ones made with sugar. These are called Carrot Apple Muffins. 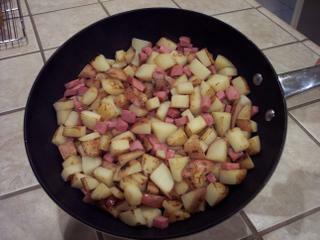 Ham and potato omelet was tonights dinner. This wasent a new recipe but one we have made before and really enjoyed. 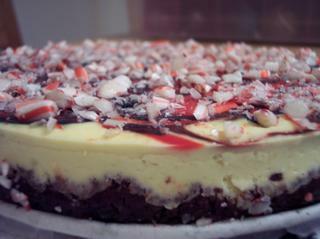 It has few ingredients and comes together in a flash. The potatoes were tender but not mushy. The ham brought a subtle smokey taste that paired well with the eggs and potatoes. 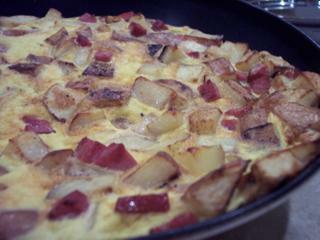 I finished this dish in the oven help to cook the eggs evenly without burning. Today's requested recipe was for the sesame chicken dish. Combine first 3 ingredients in a large ziploc bag. Add chicken to bag; seal and marinate in refrigerator for 1-2 hours, turning bag occasionally. For the Salsa - Combine watermelon and next 8 ingredients - cover and chill until ready to serve. Remove chicken from marinade. Sprinkle chicken evenly with 1/4 teaspoon salt. Place chicken on the grill. Cook 6 minutes on each side or until done. Remove chicken from grill; let stand 5 minutes. Cut chicken diagonally across grain into thin slices. Top with salsa. Most of the morning was spent cutting up chicken breast that we got for a killer price at Sprouts. It was very fresh and they do not add any "solution" or other funky stuff to it. I think we may have over done it a tad as the freezer sure seems full but hey - it was a good deal! Repeat night for dinner - we had the sesame chili chicken again. It reheated quite well and the watermelon salsa seemed to keep most of its integrity. After randomly opening the small-batch baking cookbook again the recipe that displayed itself was "Just plain good cupcakes." Cupcakes huh? Who doesnt like cupcakes! The recipe made 4 normal size cupcakes. It is basically a from scratch yellow cake. The frosting I decided to put on also came from the book. Peanut butter frosting was the name and it is more like a creamy, soft, and spreadable fudge. 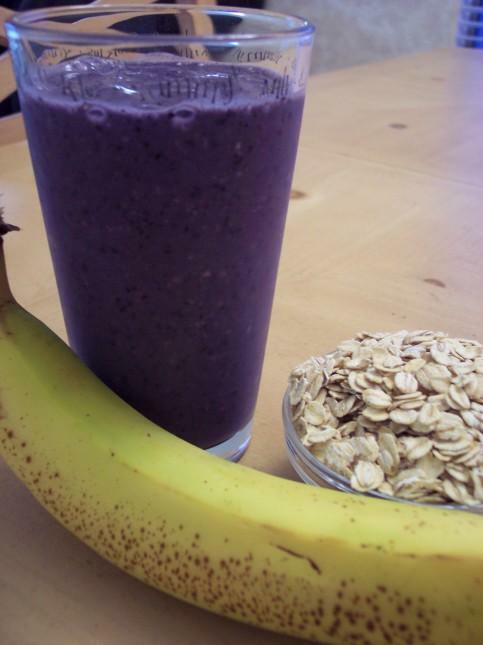 It is a very tasty combo! The frosting would be great on a chocolate cupcake too. Another winner! Busy day! After witnessing a car fire at Trader Joes and then having to pick up a couple things for dinner I finally have a few minutes to post some recipes and what we ate tonight. I found some great herb mixed greens that I used for the salad and had to get some fresh mozzarella. 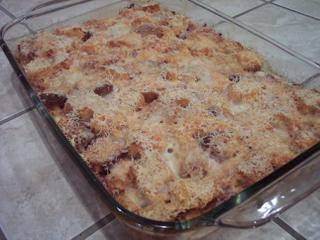 Tonight for dinner was Fresh Mozzarella, Sun-Dried Tomato, and Prosciutto strata. I served a side salad of greens, fresh berries, and candied walnuts in an Apple Cider dressing. The bread used in the strata was toasted Rosemary Focaccia. The pockets of gooey mozzarella complimented the prosciutto so well. If you would like to see a crisper picture, don't forget you can click on the image and it will bring a larger picture up! Here are some of the recipes that have been requested. Please let me know if you have any questions - thanks again for visiting! Cook the broccoli flowerets by your preferred method until tender-crisp. Immerse in ice water to cool and drain thoroughly. In a large bowl, stir together cornmeal, flour, baking powder. In a small bowl, beat cottage cheese, buttermilk, egg, egg whites, butter and sugar until well blended. Add cheese mixture to flour mixture and stir just until dry ingredients are evenly moistened. Pour batter into a greased round 8-inch baking pan or quiche dish. 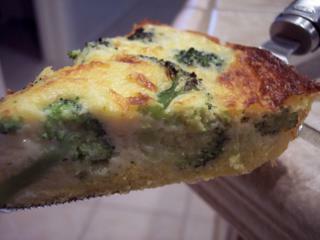 Gently press broccoli decoratively into batter. Bake in a 350 oven until center of kuchen feels firm when lightly pressed, about 30-40 minutes. Prepare a glass 9 by 13-inch baking dish with cooking spray. 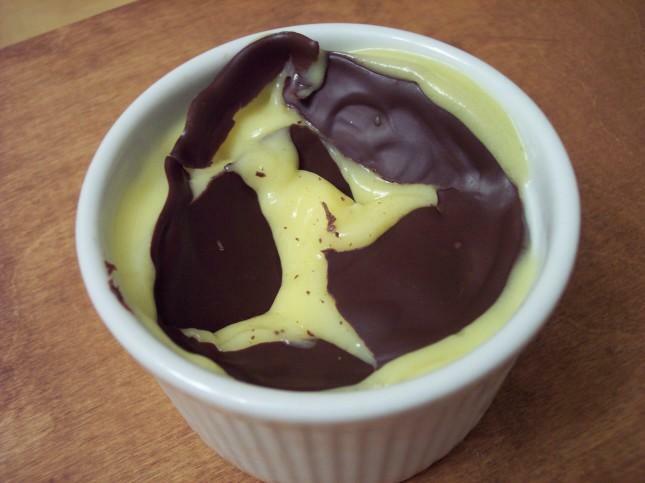 Melt the butter over very low heat; when melted remove from heat and gently pour into a large bowl. With a wooden spoon stir in the sugar and vanilla. Add the eggs 1 at a time, beating well after each addition. Add flour, cocoa, baking powder and salt in a medium bowl and whisk together. Combine the flour mixture slowly to the butter, sugar, and egg mixture – mix well. Mix the peanut butter and Nutella in a small microwave safe bowl, and heat until it reaches a runny consistency. Stir the mixture into the batter; then pour it into the baking dish. Temperature was a record high today at 115. Ugh! But its a dry heat right? *grumble* Thankfully for central air I did get some baking done today. I needed something for Jeff to bring into work tomorrow so I thought I would go with something he has not brought in before. 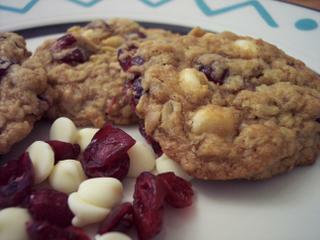 This time it is Cranberry Oatmeal cookies. Yield was 46 so I guess we can keep a couple! Since I was on a mission to find decent watermelon I thought it was fitting to make a new and refreshing recipe for dinner. It did not take long at all to make (not counting the time for marinating). 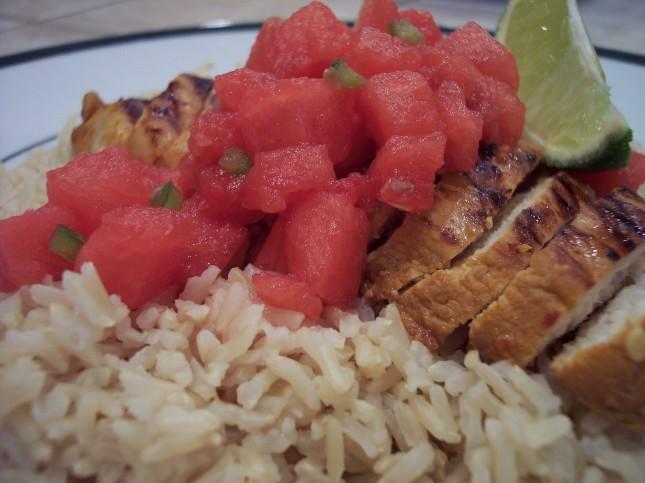 Sesame-Chile Chicken with Gingered Watermelon Salsa served over a mound of brown basmati rice. It had a nice but subtle kick from the jalapeno and ginger. 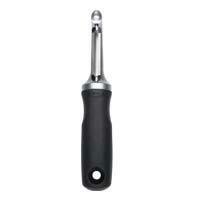 Finally after talking about it for the longest time I gave up my very old peeler. RIP 'Ol Rusty! We have a few OXO products and have had no issues so I went to them to find a new one. I came home with this. The new recipe for dinner this evening ended up being much more tasty than we thought it would. A couple years ago if you asked me if I would ever eat, let alone make something like this I would of laughed. My my how times have changed! The two pictures below are of Flatbread with Prosciutto, Asparagus, and Shaved Aged Parmesan (hurray for the new peeler - it worked great for shaving the parmesan). I did make the dough in the bread machine as I didnt have the time to knead. Baked for only 10 mins! Easy and fast. So we may have went a little nuts with the produce buying today. Everything just looked so good that we couldnt pass a lot of it up. So off to change the menu this week to accommodate the new fruits and veggies. Tonight's DVD movie selection will be Lost in Translation. We have been meaning to watch this movie and thanks to Netflix we are finally catching up on a ton of movies that we missed. The upcoming week features 3 new and one repeat recipe that we liked. Stay tuned and see how they come out! Most of today was spent running around picking up a few items here and there that we needed for the house. Home depot sucked us in and decided we needed to spend money. Next time I will just keep driving and not stop - although we may have to go back for some herb plants that actually looked decent. Kohls was next for us as they had their "big" sale that they seem to have every weekend. 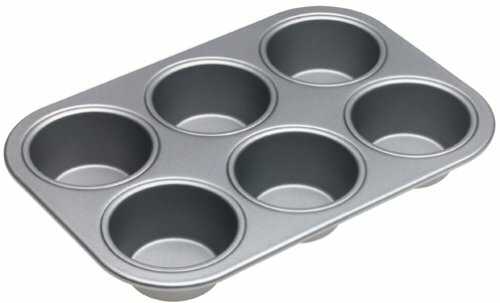 Nothing too great, but I did pick up a nice 6 cup muffin tin from Calphalon for $5. Since we were out for awhile I was looking for something nice, cold and refreshing. Looking at the blender in the corner and seeing what we had in the freezer I made us a Banana, oatmeal and blueberry smoothie. Mmmm - that hit the spot! If you have bananas that are past their prime and don't feel like making banana bread you can easily store them in the freezer. They freeze great and really thicken up smoothies. Off to plan the menu for the upcoming week! The weekend is here! Today flew by as much cleaning and picking up of the house was done. Broccoli and Cornmeal Kuchen was on the schedule for dinner tonight. 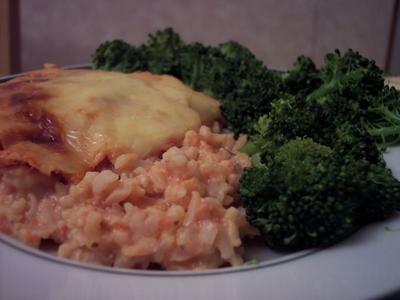 Since we had some nice broccoli from the farmers market this was a great veggie friendly dish. This is sometimes served with a yogurt sauce but we like it plain. I was able to use the convection toaster oven tonight since it was way to hot to heat the oven for the length needed. I forget how well it works sometimes! I cracked open the new baking cookbook Small Batch Baking and the recipe that showed itself was Chunky Peanut Butter Cookies. I can't even remember the last time I had a peanut butter cookie so I knew we had to make these. The recipe makes 8 cookies (hurray!) so it came together very quick. The dough was nice to work with. First one out of this book is a big hit! Can't wait to try whatever comes up next. Put a large pot of water on to boil for cooking pasta. Also bring about 1 inch of water to a gentle simmer in the bottom of a double boiler. Heat oil in a medium nonstick skillet over medium heat. Add prosciutto and cook, stirring often, until heated through, about 2 minutes. Add garlic and crushed red pepper; cook, stirring, for 30 seconds. Remove from heat. Whisk eggs, broth and pepper in the top of the double boiler to combine. Set over the simmering water in the bottom of the double boiler and cook, whisking constantly in a slow, steady, figure-eight motion, until the sauce steams and thickens enough to coat a metal spoon, 5 to 7 minutes. Remove the top pan from the heat and whisk the sauce rapidly so it does not continue to curdle. Meanwhile, cook pasta in the boiling water, stirring often, for 5 minutes. 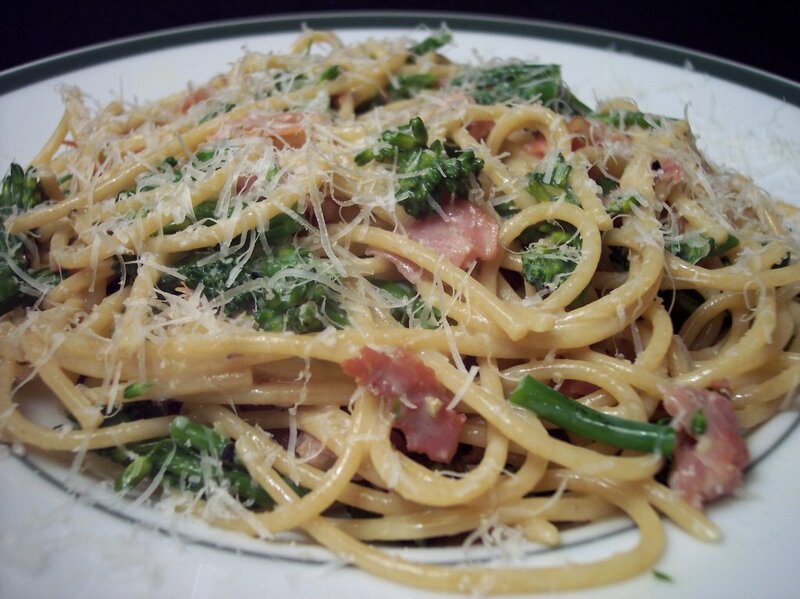 Drop in broccolini and cook until the pasta is tender but firm, 4 to 6 minutes more. 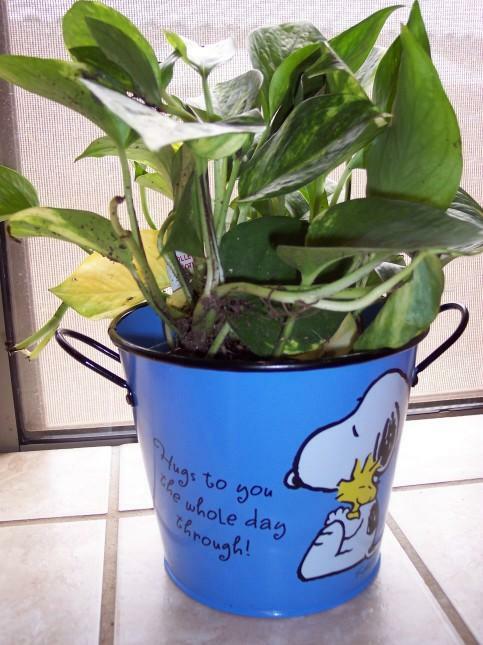 Drain and place in a large bowl. Add the egg sauce, the prosciutto mixture and cheese; toss to coat well. Tonights dinner was leftovers from the Adobo pork and potatoes. This dish reheated very well! Since I didnt get a chance to cook or bake anything new tonight I thought I would share an item that I made for christmas last year. 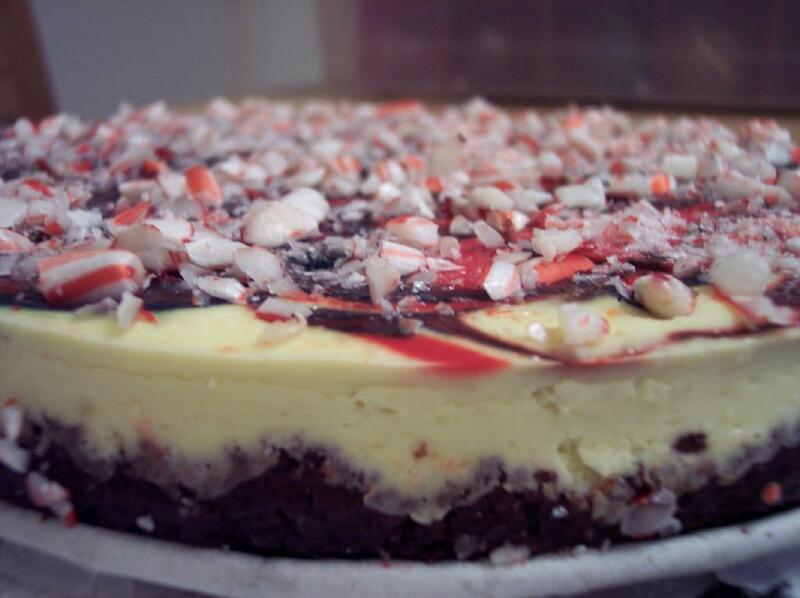 We couldnt decide what dessert we would like with a holiday dinner so after going through my recipes and combining a couple different cheesecakes we came up with this. It was very well received and I really liked the presentation. Don't forget you can click on the images and it will display a larger/more crisp picture.